Being a relatively new inhabitant of the Ozarks, a region we might generally place from the Springfield, MO area to southward of Eureka Springs, AR, I have only begun to uncover all of its hidden treasure. Eva and I recently spent our first anniversary in Eureka Springs on a long weekend we spent horseback-riding, relaxing, and finally wine-tasting. Keel’s Creek Winery is located on Highway 23 on the way back up to Springfield. Much of the town is populated by touristy attention-grabbing signs about the Arkansas Hoe Down (boasting real dancing hicks) and Promised Land Drive-In Zoo (boasting real animals from the bible), but just as Van Buren Rd. becomes a highway, the attraction shifts as well. The front lawn is adorned with blue and green glass set before an unassuming and quaint building; in contrast to its rather loud neighbors. If you’re going to find wine in Arkansas, this is one of only six places you can do so. Before prohibition, Arkansas was rife with wineries producing thousands of gallons of the savory stuff each year. Now, more than half of the counties in Johnny Cash’s home state, are as dry as Folsom Prison walls. 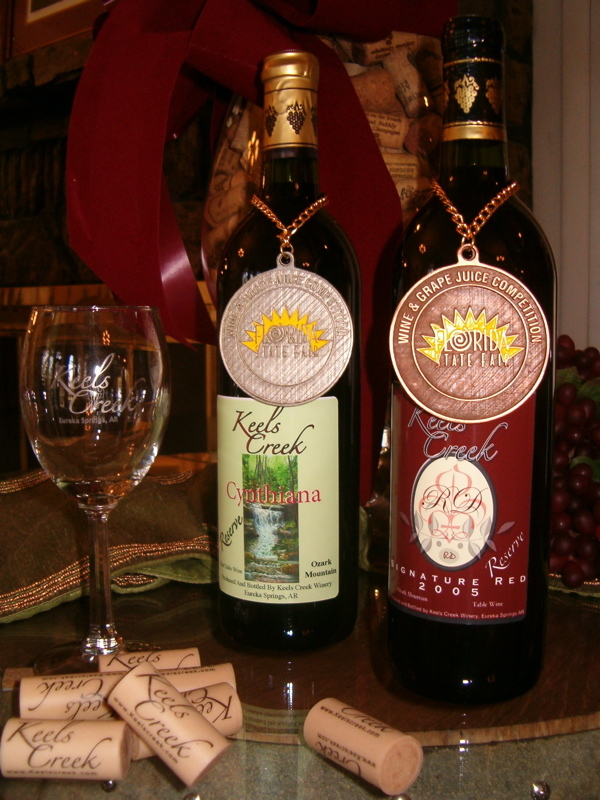 Nevertheless, Keel’s Creek offers up a wonderful alternative to any supermarket variety wine. Most of their over ten varietals are around $10 a bottle. A tasting runs a whopping five bucks and includes the whole gamete of semi-sweet to dry as the county next-door (and you get to keep the glass!). What I found really blew my mind. Previously, I may have thought, “Arkansas wine…I’m sure it’s about as delicious and complex as my uncle’s basement brew from his Mr.Beer kit…” Wrong. Their Award-winning chambourcin was full-bodied with rich tannins, dark complexion, and a delightfully sweet finnish. Maybe the next season of Jame’s and Oz’s Big Wine Adventure should plot its course for the Midwest! Overall, I found the common thread in each wine to be the flavor of the grape over some desired and overtly abstract marketability. Their Muscadine was not bloated with high-fructose garbage meant for a higher class alternative to Boone’s Farm, but rather just the natural sugars of the fruit itself. Beautiful and simple. If you’re a wine lover of any type, a budding amateur or a real snob, looking for an out-of-the-ordinary trip on a dime, then pack your bags for Eureka Springs and head to the Creek.